Sony KDL-40EX524 review | What Hi-Fi? Too much choice can be paralysing: it can be hard to take the plunge and hand over a hefty bundle of notes. But we think being able to pay anything between £300 and £3000 for a 40in TV is a good thing, as it tends to mean decent value. A Freeview HD tuner, bags of internet TV content (including Sony’s Qriocity service), four HDMIs, USB, DLNA media streaming, Full HD… Sony has ticked plenty of boxes. This edge-lit LED set is 4.2cm deep, and easy on the eye. The interface is a hybrid of the old and new, giving you endless icons and options – again, too much choice – which could surely be more easily arranged. Nevertheless, we’re soon watching the thing, and are wowed by the excellent Freeview HD images. The level of detail and sense of depth on offer are better than most, while edges are sharply drawn. Sound is sadly average, though. Thick and unclear, we found ourselves cranking the volume in an effort to improve matters. The Blu-ray of Se7en tests the 40EX524’s ability with dark blacks. It can certainly go dark but better – and more expensive – sets retain more detail. Hints of backlight unevenness can be seen in the corners at times when the screen is blank, but it doesn’t distract when watching content. Edges remain sharp, detail recovery is good, and a switch to DVD reveals that this TV is also very capable when it comes to upscaling standard-def content. 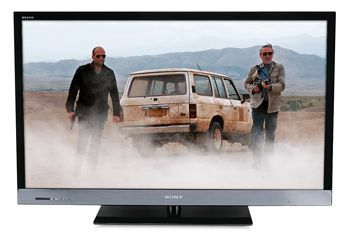 One thing that does catch our eye is a touch of motion blurring: Sony is normally so strong in this area but this 50Hz set does struggle with particularly testing scenes. Ideally, we’d like it brighter, too. Try as we might, we found it impossible to get a killer combo of inky blacks and bright whites; no deal-breaker, but a mild concern. So, it is possible to pick holes in the performance of the Sony KDL-40EX524: no 3D, black levels could be better, and there are some issues with motion. But it still represents good performance and value.